Mastering: CGB @ Dubplates and Mastering Berlin. Artwork: MG. ©2013 All Rights Reserved. 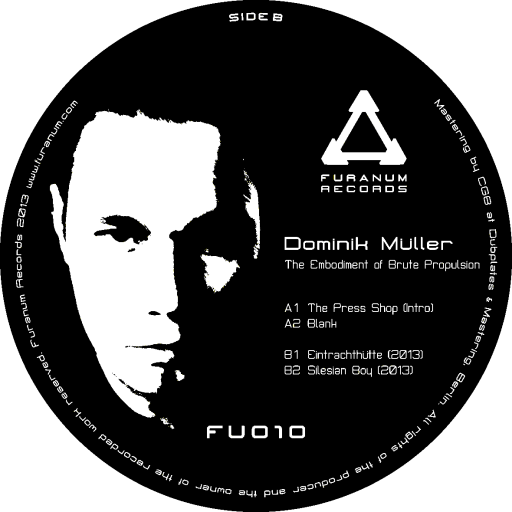 Following a hiatus of nearly two years, the latest Furanum offering signals the return of solo work from label owner Dominik Muller and coincides with a pivotal tenth release on the label. The Embodiment of Brute Propulsion most notably features for the first time on vinyl robust reconstructions of two the artist’s most seminal compositions. Both previously released on UK’s Locked Records, ‘Eintrachthutte’ (2007) and ‘Silesian Boy’ (2009) have served as stepping stones for the artist’s evolving musical vision and represent a raw reflection of the influential period spent immersed in his industrial homeland of Upper Silesia. Audibly modernized and now endowed with a substantially augmented lower end, the two capably maintain the feel and imagery of the originals: the former the impressions of a visit to an iconic location bearing the same name, and the latter a personal exploration of identity in the context of youth. Also given the wax treatment for the first time is ‘Blank,’ a previously unreleased piece that has been a mainstay of live performances in various forms since 2011. Defined by a recurring and ineluctable pattern, both intrusive yet irresistible, its orphic narrative is subtly driven forward by a series of drones that weave their way around a dense rhythmical panorama. Lastly, the repertoire is complemented by a vinyl-exclusive personal capture of an industrial press shop in operation. Seemingly bare, inanimate, and inexorably bound to its predeterminate cycle of motion, the mechanized landscape stands as a symbolic archetype of the aesthetic ambitions of the label. 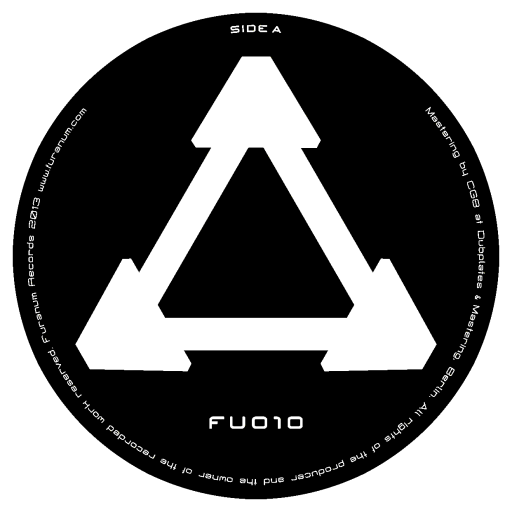 Mastered at Berlin’s D&M by CGB, Fu010 will be available on 12″ as well as in digital format at all fine music retailers.